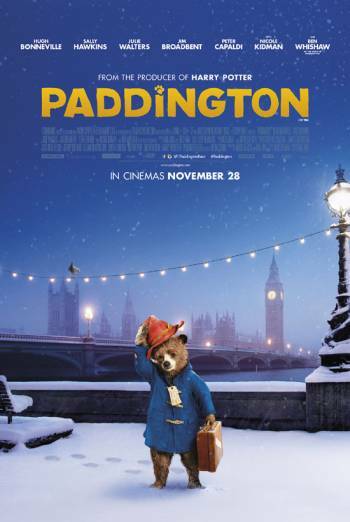 PADDINGTON is a family adventure about a talking bear from Peru who travels to London looking for a new home. There are infrequent scenes of dangerous behaviour, including Paddington hiding from a villain inside a refrigerator and riding on a skateboard while holding on to a bus, as well as a brief scene of a boy strapping fireworks to his shoes. There are occasional sequences of mild threat when Paddington is chased by the villain who threatens to kill and stuff him, as well as a brief sequence in which Paddington lies unconscious on a table while a taxidermist prepares their tools nearby. There is also a short scene in a jungle when Paddington and his family run for shelter during an earthquake with trees falling around them. There is some mild innuendo, including a comic sequence in which a man disguised as a woman is flirted with by another man. There is a single mumbled use of 'bloody'.